If you know me, then you’ve heard about my obsession with the indie-rock, all girl supergroup, boygenius. It is composed of Julien Baker, Phoebe Bridgers, and Lucy Dacus. I’ve been obsessed with at least Baker and Bridgers since they put out their first full albums, Sprained Ankle and Stranger in the Alps, respectively. Then earlier this year, Dacus released Historian, and I was immediately drawn in by her smooth vocals and relatable lyrics. 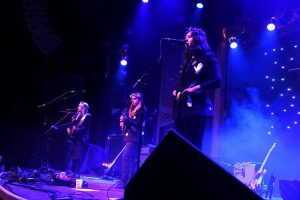 I just about lost my mind when I heard about boygenius, and most definitely did when I attended their concert at the Ogden Theatre in Denver last Monday. Julien Baker is one artist who has continuously amazed me with her meaningful, relatable lyrics and insane vocals; it was nearly impossible for me to not cry seeing her live. She walked out, meek, short and dirty-blonde-haired; you would never expect everything she was capable of. She started off without a preface, jumping into “Sour Breath” from her newest album, Turn Out the Lights. The lines “The harder I swim, the faster I sink” rang out into the audience, hitting me so hard that tears streamed down my face. I looked around and everyone else’s reaction was very similar to mine, with all eyes glued to Baker. She continued on with equally powerful songs, “Shadowboxing”, “Sprained Ankle”, and “Everybody Does.” After not taking a break to talk to us, she finally looked up and thanked us for allowing her to sing about the worst things that have happened in her life with a smile. She looked down, laughed, and said “I’m a piece of garbage.” This was the only time that Baker stopped to really talk to us, she obviously was very shy as a person, showing us who she is through her music. 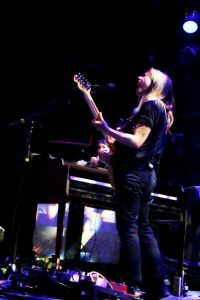 Throughout the set, Baker switched between playing guitar and keyboard, accompanied by her violinist, Camille Faulkner. Baker’s set was by far the most stripped down and simple, but hit the hardest. The entire audience was silent during her performance, taking in her lyrics and internalizing them. 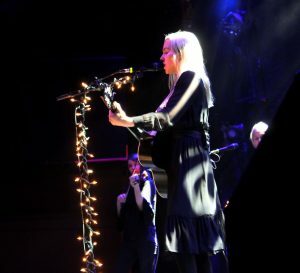 Perhaps the most engaging song was the title track from Turn Out the Lights, where her vocal and instrumental chops are really showcased, especially towards the end of the song. The only word I can think of to sum up Baker’s performance is transcendent. 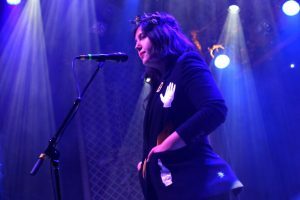 After the solo acts, all three came out for the main event: boygenius. 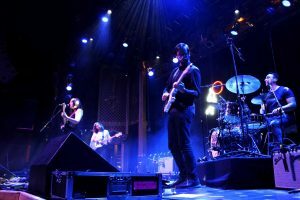 The group has an album consisting of six songs, all written and performed by Dacus, Bridgers, and Baker. They went through the entire album, which were all absolutely stunning, but the last two songs in particular stood out the most to me: “Salt in the Wound” and “Ketchum, ID.” “Salt in the Wound” is mostly sung by Dacus, but features groundbreaking harmonies with Bridgers and Baker. When it came to Baker’s guitar solo at the end of the song, Bridgers and Dacus stood beside her, playing air guitar, and eventually falling to the ground, laughing. Lastly, for the song “Ketchum, ID”, all three stepped away from the microphones and encouraged the audience to sing along to the chorus. This song features a simple guitar melody played by Bridgers, and a verse by each artist. The room was dead silent as we all leaned in to hear them, and the whole room joined in singing the chorus. As they exited the stage, they were joined with rapturous applause. We all filed out feeling a whole roller coaster of emotions from these three absolutely amazing and dedicated ladies. I can never thank them enough for the amount of vulnerability they showed on stage. I cried at a boygenius concert, and I’m completely okay with it.